Over recent years, gabion structures have been increasingly used in Russia in the field of hydraulic engineering. Addionaly the use of gabions is increase as well in construction and reconstruction of complex coastal protection structures, building of quay walls, lining of dikes, strengthening of bridge crossing abutments, construction of culverts, etc. However, the assessment of their interaction with ice cover of pools, especially in the northern regions of Russia, remains an issue of current interest. The effect of ice cover manifests differently and depends on many factors: ice field length, ice thickness, snow cover, temperature intensity of its increase, coefficient of friction against the material and the soil, mechanical properties of ice, water level fluctuations, form of the pool and planned structures. 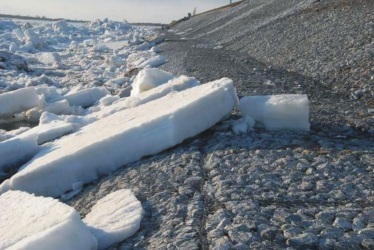 When designing gabion protection structures intended to be used in heavy ice conditions, it is necessary to take into account the possible impact of moving ice floes, as they may cause extreme load on the structures. As this issue is topical, it was decided to organize and conduct a targeted research on using gabion structures in harsh climate conditions and study how ice affects them. The work took place at Vedeneev VNIIG JSC with the direct involvement of Moscow State University of Environmental Engineering and Maccaferri Gabions CIS LLC. The most comprehensive analysis and evaluation of the ice-gabions interaction were made on the basis of field data on the object “Reconstruction of Tomsk levee”. The final technical solution to protection the levee slopes involved laying Reno mattresses on the slope with a stopping tooth below and setting the apron to the bottom of the river. The thickness of Reno mattresses ranged from 0.17 m in the upper part of the slope up to 0.3 m in its lower part; the dimensions of box gabions for the stopping tooth were 4 х 1 х 1 m.
The overall stability was calculated using Maccaferri’s software package MacStars2000. The source data for the calculation were: geological findings (traction, angle of internal friction, weight of the soils in dry and water-saturated state); the hydrological regime of the river, all kinds of mechanical load and seismicity. When the protection of Tomsk levee slopes were visually examined after two seasons of operation, local damage of structures and breaks of individual wires were revealed. The integrity of upper lids of the Reno mattresses made of double-twist grid was damaged. The most severe damage occurred as a result of ride up of ice field on the levee slope, i.e., due to dynamic effect. However, no significant horizontal and vertical motions of the structures were found. On the basis of this fact, we can conclude that in their interactions with ice fields, gabion structures are more resistant to shearing moments and less resistant to dynamic effect of drifting ice features and riding up of ice masses on the slope part of the protection.